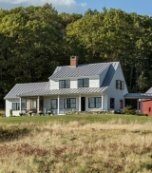 Farmhouse inspired home design in the 21st Century has seen a real surge in tactile textures and warm grey color tones. 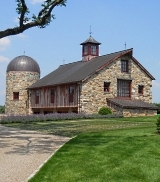 Often this is associated with a few famous brand names like Pottery Barn or Restoration Hardware. The actual trend is not so much about the branding but more about the overall aesthetic that has been popularized through the work of those brands and other designers who embrace the overall style. 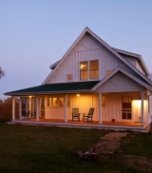 It has been coined Farmhouse or Modern Farmhouse design. It is a beautiful look in interior design and feels instantly inviting and comfortable. 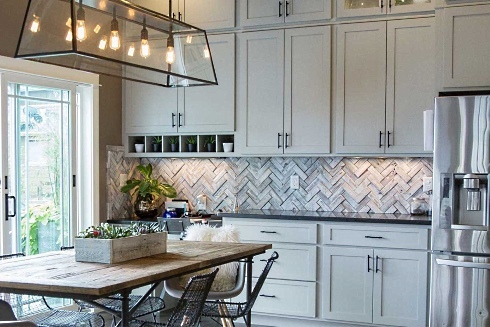 Everitt & Schilling's herringbone reclaimed wood tiles are included in a fabulous farmhouse design by a wonderful designer named Brooke Wagner in Costa Mesa, California. 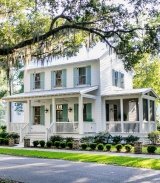 The home has an incredible look and is bathed in soft grey colors and warm reclaimed wood accents. 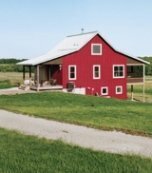 What Defines Farmhouse Inspired Home Design? 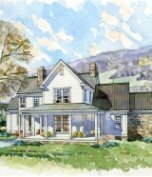 The Farmhouse aesthetic is a very diversified look with some consistent themes that recur throughout the design. 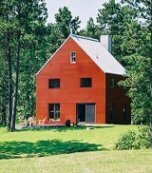 One element that shows itself often is the use of reclaimed wood. 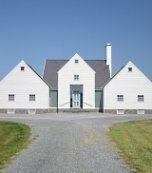 It adds a character impression of age and history to the design that enables the overall look to feel as if it has been there for a long time. 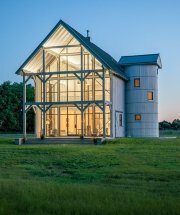 The idea behind using reclaimed wood is to make the different rooms seem like they were built using the beams as structural elements of the design. 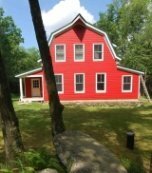 While they are often used just as decoration, the wood gives the illusion that the room has been updated within the confines of the old structure. 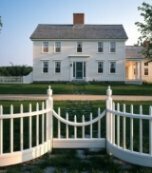 It makes the home feel as if it is old and historic while being completely updated. 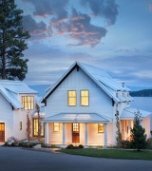 In the design by Brooke Wagner, the home utilizes a significant amount of reclaimed materials to help support this feel and look. From the entrance, kitchen and dining room to the master bedroom and bath, the reclaimed wood accents add a richness and texture that help define the theme of the design. 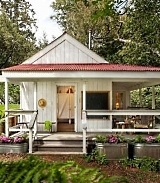 One other hallmark of farmhouse inspired home design is the use of white in the color palette. 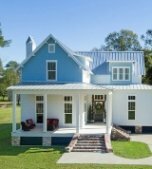 With the blending of the dark wood accents and the blue and grey accents, white tends to play the anchor in the color way. 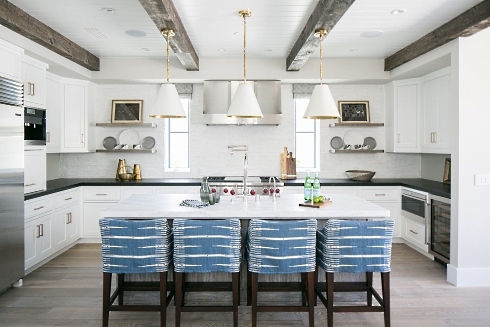 It brightens the appearance of the space but also lets individual elements like reclaimed wood or different hardware stand out against the backdrop. 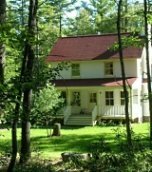 And while it may not have been what was actually utilized in any late 19th century farmhouses, it is honest enough in its interpretation that it appears in our minds as what would be true to the period. 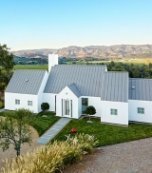 White feels clean and beautiful and gives everything a very fresh appearance which helps contribute to the impression of the farmhouse design. 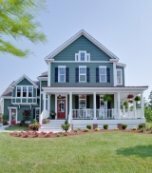 Finally, one consistent marker of a stunning farmhouse inspired home design is the use of accent colors, patterns and materials. 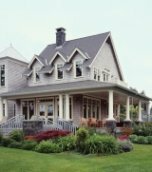 Using cool grey tones and interesting patterned fabric makes the farmhouse feel rich and luxurious. Each individual element stands out against the white backdrop and becomes a beautiful touch that elevates the room and look. In the example, below, from Brooke Wagner's design, she utilized a multitude of grey shades in supportive and complementary patterns to make the room feel elegant. 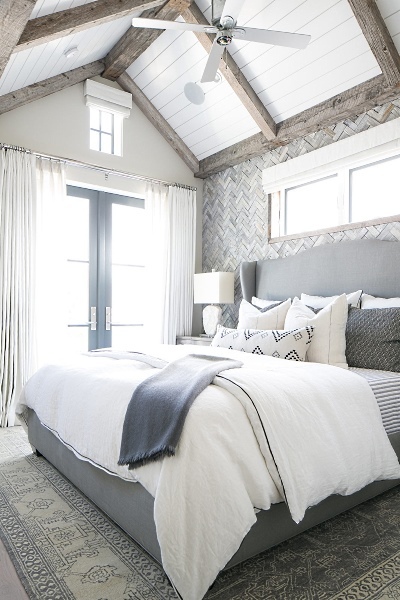 The patterned rug, along with the anchoring grey headboard, are simply beautiful. One of the reasons we at E&S love this design is that the use of wood accents against a soothing backdrop of color offers a really diverse and beautiful combination. 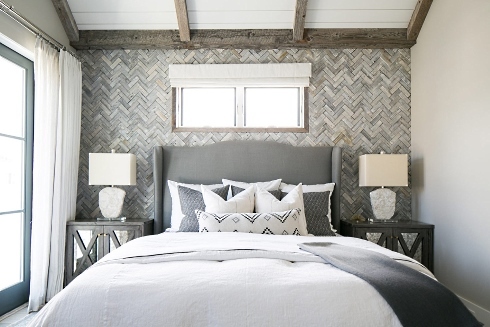 In the master bedroom alone, where the reclaimed wood tile is featured, there are reclaimed wood beams, shiplap on the ceiling and reclaimed herringbone tile on the walls. The more we analyzed this room, the more we realized that this blending of wood accents is the anchor that gives the room its very luxurious feel. 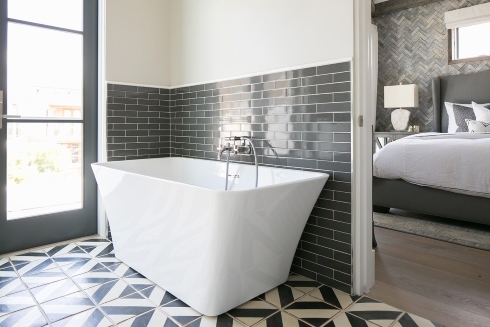 The white wash tile helps tie the overall farmhouse design into the master bedroom by using both an interesting pattern and a white overall tone. 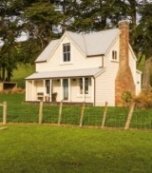 It really is a beautiful outcome and makes this one of the better farmhouse designs we have seen. 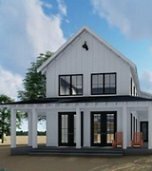 Farmhouse inspired home designs are easily conceived but take a lot of thought to actually execute. 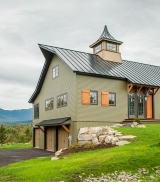 This amazing design and home is one of the best examples we have seen that incorporates the modernity of great colors and accents, along with the beautiful backdrops of white colors and reclaimed wood. 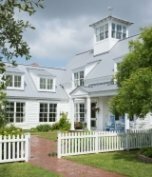 Wood wall tiles are a great material for adding depth and texture while being incredibly supportive of the overall farmhouse design. 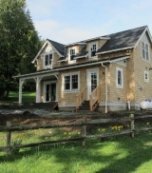 If you are working on a stunning farmhouse design, E&S reclaimed barn wood tile might be just the signature element you are looking for! 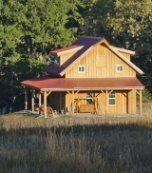 Please check back often or subscribe to our RSS feed, as we frequently add new farmhouse inspired home designs to our site.